India supplies 20% of global generic medicines market exports, in terms of volume, making the country the largest provider of generic medicines globally and expected to expand even further in coming years. Epidemiological factors like 20% increase in the patient pool, new diseases, and lifestyle and increasing prevalence of lifestyle diseases will boost the demand for pharmaceuticals in India. Goldstein Research analyst forecast the India pharmaceuticals market size is set to reach USD 76.7 billion by 2024, at a CAGR of 15.9% over the forecast years. 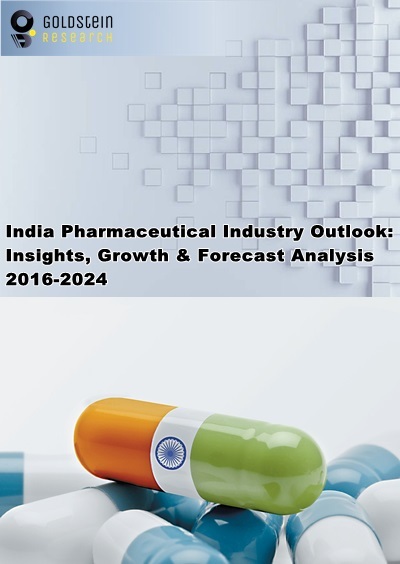 The report covers the present ground scenario and the future growth prospects of India Pharmaceuticals Market for 2016-2024 and statistics of Branded and Generic Drugs along with the details of ongoing projects in pharma sector in India. We calculated the market size and revenue share on the basis of revenue generated from major players across the globe. On the basis of type, API’s hold the largest market segment as India has become the third largest global generic API merchant market by 2016, with a 7.2 percent market share and The Indian pharmaceutical industry accounts for the second largest number of Abbreviated New Drug Applications (ANDAs), is the world’s leader in Drug Master Files (DMFs) applications with the US. India Pharmaceuticals Market Outlook 2016-2024, has been prepared based on an in-depth market analysis from industry experts. The report covers the competitive landscape and current position of major players in the India pharmaceuticals market. The report also includes Porter's five force model, SWOT analysis, company profiling, business strategies of market players and their business models. India Pharmaceutical market report also recognizes value chain analysis to understand the cost differentiation to provide a competitive advantage to the existing and new entry players. Our India Pharmaceutical market report comprises of the following companies as the key players in the market: Sun Pharma, Dr. Reddy, Lupin, Cipla, Aurobindo, Candila. Glenmark, Torrent Pharma, Alkem Lab, Divis Lab, Piramal Enter, Ipca Lab, Glaxo SmithKline, Abbott India, Biocon, Jubilant life, Sanofi India, Wockhardt, Pfizer, Dr Lal Path Lab, Merck, Hikal, Novartis India, Eris Life. According to the report, major driving factor for India pharmaceutical industry is the diversified portfolio that accounts for over 10% of global pharmaceutical production. Over 60,000 generic brands across 60 therapeutic categories and manufactures more than 500 different APIs 35.7% of all drug master filings from India is registered in the USA in 2015. Further, the report states that the major challenge is that currently, the industry is dominated by thousands of small, medium and large players. Most players will not be able to address quality and regulatory issues adequately and therefore, going forward, the industry will have a bimodal distribution. Based on players, highest expenditure based on research and development is done by Sun Pharma (USD 352 Million), followed by Dr. Reddy (USD 199 million). Cipla formed an exclusive partnership with Serum Institute of India to sell vaccines in South Africa. Dr. Reddy’s accounted for the largest share in the Indian pharma market, with sales of USD 2.2 billion in 2016 and Lupin being the second largest with sales of USD 2.09 billion in 2016 in Indian Pharma Market. What is the revenue of India Pharma in 2015-16 and what would be the expected demand over the forecast period?